A Florida police department has accused local sheriff deputies of failing to confront the mass shooter or enter Marjory Stoneman Douglas High School during the attack last week. Broward County Sheriff’s Deputy Scot Peterson, the armed school resource officer, was branded a ‘coward’ by President Trump after it emerged he waited outside the building during the recent mass shooting that claimed the lives of 17 students and teachers. Now Coral Springs police officers have revealed that when they responded to the shooting, they found another three Broward County Sheriff’s deputies cowering behind their vehicles, law enforcement sources told CNN. Not one of the four deputies had entered the school, sources said. Broward County Sheriff’s Office did not return reporters’ requests for comment. Peterson was suspended after the allegations emerged, and Broward County Sheriff Scott Israel said that he plans to investigate the claims that the other three officers did not try and tackle the shooter. ‘If our investigation shows that our deputies made no mistakes or did things right, or it’s not corroborated, there will be no issue,’ Israel told the Sun Sentinel. Surveillance footage, from cameras at the scene, is currently being reviewed which will provide definitive proof of the sheriff’s office response, along with an official report from Coral Springs officers. But it seems that the Broward deputies’ alleged failure to act is causing friction between the two law enforcement groups. 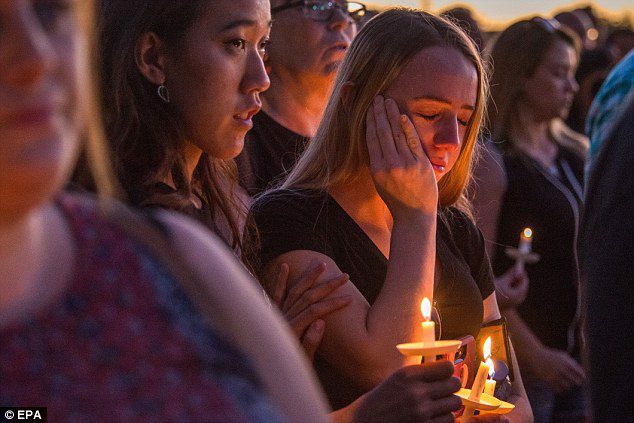 That growing resentment boiled over on February 15, the day after the fatal shooting, when officers from both Coral Springs and Broward attended the candlelit vigil for victims. 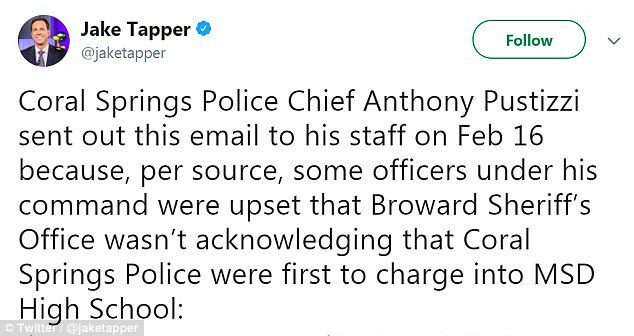 Coral Springs City Manager Mike Goodrum angrily confronted Broward County Sheriff Scott Israel, in front of a dozen witnesses, over the claims that Israel’s officers had remained outside the high school while students could have been bleeding out inside, sources said. Goodrum later admitted to having a ‘heated moment’ with the sheriff but said they had put the confrontation behind them. 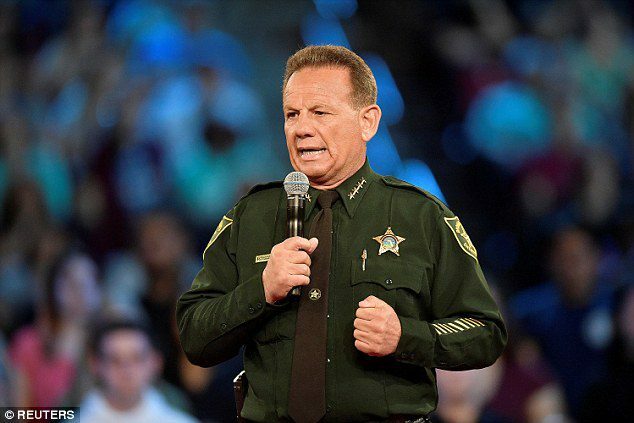 ‘Given the horrific events of that day emotions were running high and the sheriff and I had a heated moment the following evening,’ he told CNN. 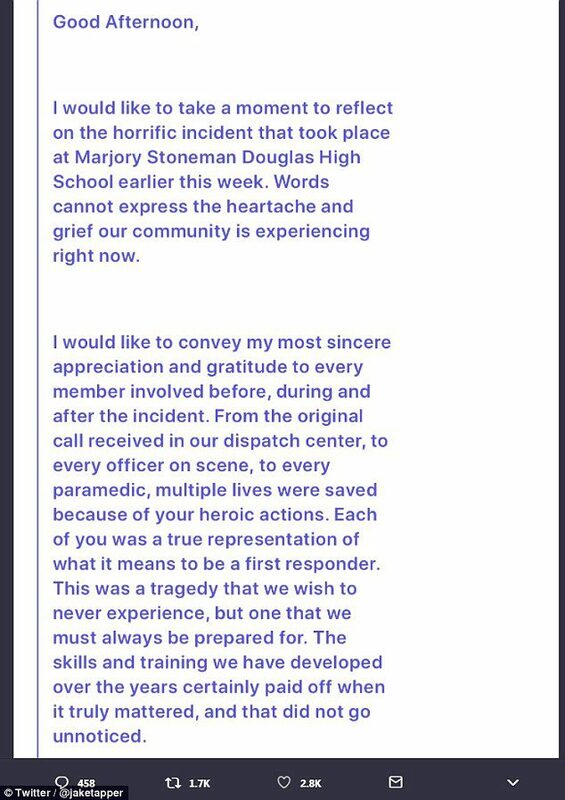 An internal email by sent by Coral Springs Police Chief Tony Pustizzi just days after the shooting, appears to show that his officers had concerned about how the Sheriff’s Department was presenting themselves in the wake of the attack. ‘I understand that another agency has given the impression that it had provided the majority of the rescue efforts, and that the tremendous work of the Coral Springs Police and Fire Departments has not been recognized,’ he said in the email, obtained by CNN. 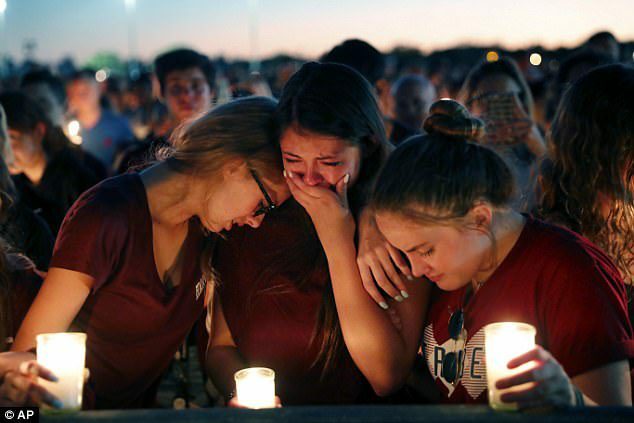 The massacre ranks as the second-deadliest shooting ever at a U.S. public school and was carried out by a lone gunman wielding a semiautomatic AR-15-style assault rifle. Coral Springs officers reported that they arrived at the scene on February 14, and were stunned to find all four deputies still outside the building, with their pistols drawn. With some direction from the Broward deputies, the Coral Springs officers entered the building to track down the shooter. Additional Broward deputies soon arrived, and two of them joined the Coral Springs officers inside the building, along with an officer from Sunrise City Police. Israel has confirmed that video from the school shows Deputy Peterson, the school’s armed response officer and former employee of the month, standing outside the building for more than four minutes while suspected gunman Nikolas Cruz, 19, opened fire inside. ‘What I saw was a deputy arrive at the west side of Building 12, take up a position and he never went in,’ said Sheriff Israel, referring to the building on campus, popularly known as the ‘freshman building,’ where authorities said the bulk of the shooting occurred. Israel told reporters the shooting in the Fort Lauderdale suburb of Parkland lasted six minutes, and that Peterson arrived at the freshman building about 90 seconds after the first shots were fired, then lingered outside for at least four minutes. Peterson has not given a reason for why he did not enter the building, Israel said. Neither the deputy nor any representatives could immediately be reached for comment. Israel said he would not release the video at this time and may never do so, ‘depending on the prosecution and criminal case’ against Cruz, the 19-year-old former student who is charged with 17 counts of premeditated murder in the assault. Peterson was initially suspended without pay and has since resigned. An internal memo on Scot Peterson’s personnel file shows that he was named the employee of the month in May 2012, and was given the honour in large part for his work with the students. 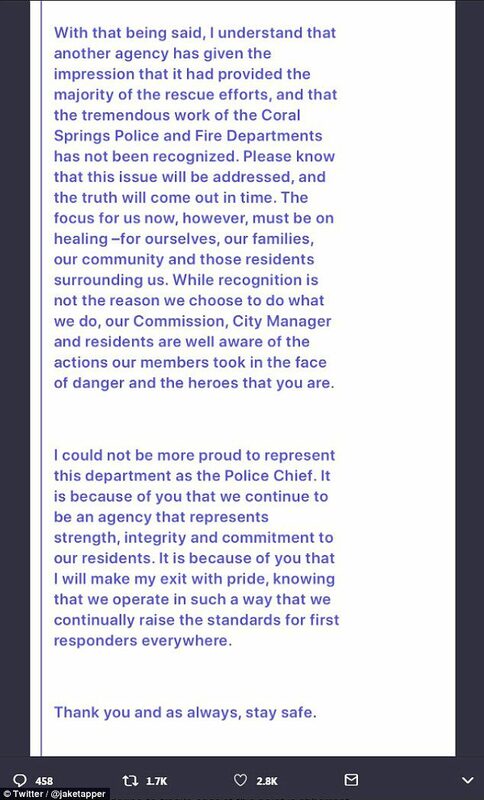 ‘Your district has recognized you as an exemplary deputy who has made a difference in the community where you serve,’ reads the memo. Performance evaluations included in that same file also show that Peterson received glowing performance reviews. 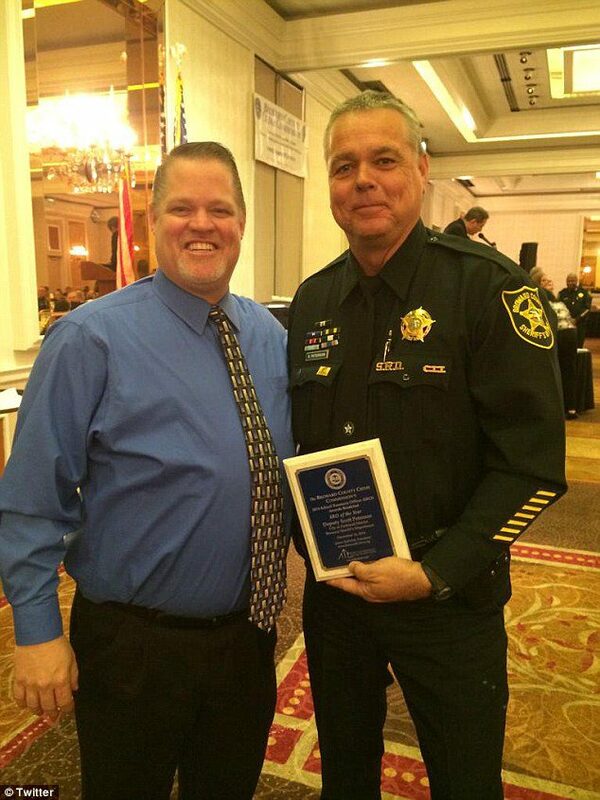 And in March 2017, Peterson was nominated for Deputy of the Year. ‘Throughout 2016, Deputy Peterson conducted numerous investigations. He always went the extra step and followed through in each case and conducted thorough follow-ups,’ wrote the recommending officer. His recommendation for that honor came in the wake of his last annual review. Deputy Peterson was the only law enforcement officer present on February 14 when the rampage started, Sheriff Israel said. He was later joined by the other three deputies from Broward County before the Coral Springs officers arrived. 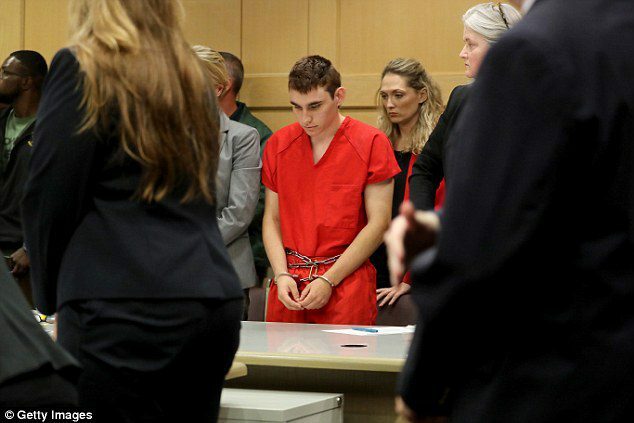 Authorities have said that Cruz, who was expelled from Stoneman Douglas High last year for unspecified disciplinary problems, made his getaway moments after the shooting by blending in with students fleeing the school for safety. Police officers arriving on the scene from the adjacent city of Coral Springs thought the gunman was still inside as they searched the building, based on a security camera video feed that they mistakenly believed was showing them real-time images but was actually footage from 20 minutes earlier. Coral Springs Police Chief Tony Pustizzi told reporters on Thursday that the confusion stemmed from human error and a ‘communication failure,’ not malfunctioning equipment.